UNIONVILLE, Mich.– The past three years have been a delightful whirlwind for the Nathan and Amy Engelhard family. In that time, they got married, had two children and still managed to remain active in the community and on their 1,100-acre organic farm in Unionville. Nathan has had a passion for agriculture since he was a young child growing up on the family farm. However, he questioned whether working in the field was his true calling. So he went to college for diesel mechanics after graduating from Valley Lutheran High School of Saginaw in 2008. He planned to farm on the side while working as a mechanic. “I realized that the agriculture roots run deeper, maybe, than I thought they did,” he said. In 2009, he bought a family farm near where he grew up. In 2010, he finished college and came home to farm full-time. The Huron Daily Tribune reports that that farm will become sesquicentennial next year. 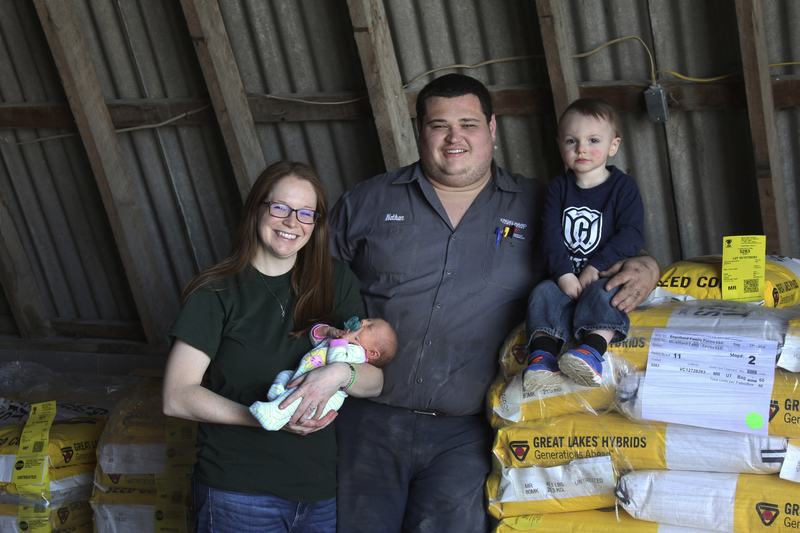 The fifth-generation farmer also has agriculture roots dating back to when his great-great-grandfather established the Engelhard family’s original homestead in 1892. Nathan and Amy raise their two children — 20-month-old Lawson and newborn Jordana — in the same house that Nathan grew up in. Nathan’s family started farming organically in 2002. From 2008 to 2009, the majority of the farm was transitioned to an organic operation. He described the process of transitioning from conventional to organic farming. Once it has been three years since the last prohibited input, an organic crop can be harvested. “Three years after you spray, or you desiccate, or whatever your last prohibited input would be, three years from then, you can harvest an organic crop,” Nathan said. “It’s not by the crop rotation, it’s by the calendar,” he added. He described organic farming as “polar opposite” from conventional farming. “But it’s still driving a tractor through the field . It’s kind of reminiscent of before genetically modified sugarbeets,” he added. Organic farmers have to be very timely with mechanical passes to properly cultivate. “We can’t be two days late with a pass . We’re always trying to stay two days ahead,” Nathan said. He said it’s not easier or harder than conventional farming — just different.